Just flown into the windy capital? Need to get into town? Great! Jump into a Mevo and leave it anywhere within the home zone when you're done. Open the Mevo mobile app and book a vehicle located at the airport. 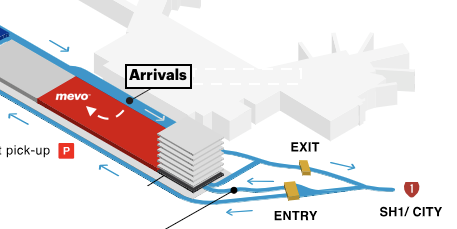 Walk from the airport terminal (bottom floor) past the airport valet parking to the Mevo park locations (image below). Unlock your Mevo using the app, hop in, drive away. When you're done, simply park the Mevo in approved car parks anywhere in the home zone.